Trading in the foreign exchange market was fairly quiet on Monday as investors awaited a slew of macroeconomic data releases during the shortened pre-Easter week. he six-month extension to Brexit ensures that any major news regarding the UK’s departure from the EU is likely to become few and far between in the coming weeks, with attention instead shifting to indicators of economic activity. 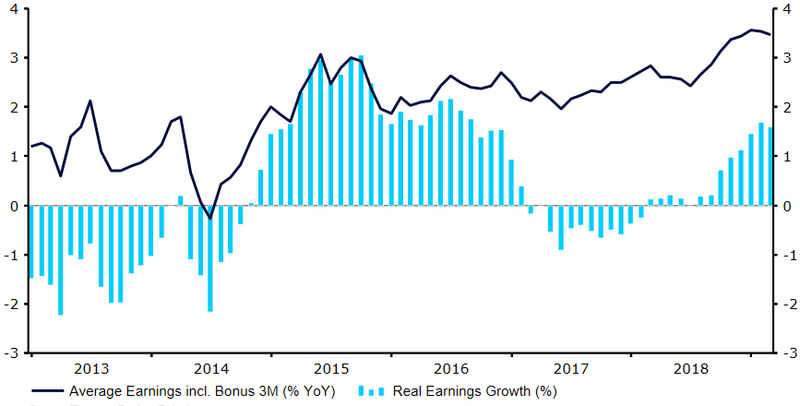 This morning’s earnings growth numbers came in bang in line with expectations, although there was an upward revision to the January number that showed wage growth accelerated to 3.5% YoY at the beginning of 2019 (Figure 1). The unemployment rate was also unchanged, although fell in actual terms by 27,000. On Wednesday, we’ll be getting the latest UK inflation numbers for March, which are expected to show that consumer price growth rose back to the Bank of England’s 2% target last month. That being said, Thursday’s retail sales are expected to be weak. This would add to the chorus of decidedly mixed economic news we have seen out of the UK economy in the past few months as uncertainty surrounding Brexit continues to translate into somewhat softer business and consumer activity. Will this week’s EZ PMIs shift the Euro? The key EUR/USD rate held firm above the 1.13 mark on Tuesday morning, although a lack of significant news from either side of the Atlantic ensured that volatility in the pair was pretty low. This morning’s ZEW confidence data could cause the common currency to break out of its current range, particularly if it compounds concerns surrounding a potential Eurozone recession. Of greater significance, however, will be Thursday’s preliminary PMIs of business activity for April. While the numbers should be taken with a grain of salt given their prematureness, it could provide a decent indication as to whether activity is beginning to recover following a disappointing first quarter. Another soft set of numbers here could help drive the Euro back below the 1.125 level this week.